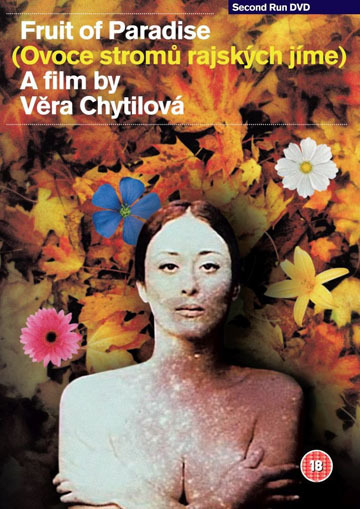 The late, great Czech filmmaker Věra Chytilová followed the success of her ground-breaking exercise in anarchic cinema Daisies (1966) with the even more extraordinary Fruit of Paradise. An experimental, densely symbolic retelling of the Adam and Eve story, Chytilová utilizes every cinematic tool to create a ravishing tapestry of ideas, textures, and visual tropes. Cementing Chytilová’s reputation as cine-anarchist, Fruit of Paradise was condemned by the authorities, banned from export and the funds withheld from Chytilová so that she would be powerless to realise her "vehicles of nihilism". Unseen for many years outside of its native Czechoslovakia the film is a cornerstone of the Czech New Wave and remains a stunning tour-de-force of colour, technique and formalism.